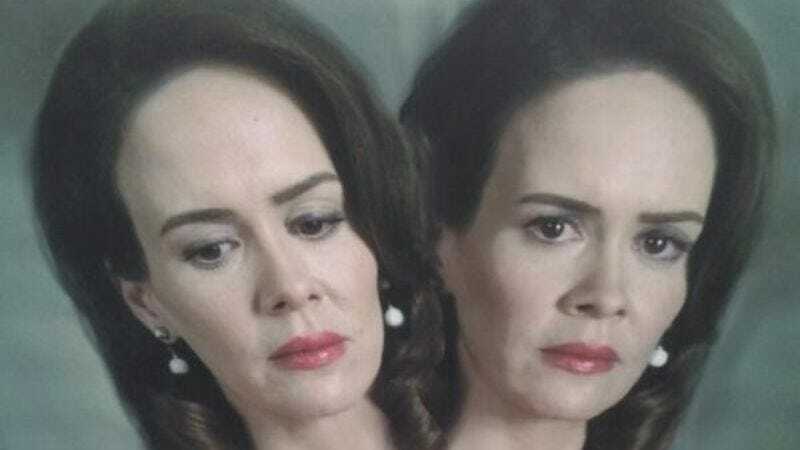 After it was already confirmed that American Horror Story: Freak Show would have both a bearded lady and a scary clown, today AHS regular Sarah Paulson has revealed, somewhat redundantly, that it will indeed also have conjoined twins. Well of course it will. What kind of freak show doesn’t have any of those things? If you were to walk into a freak show and not see conjoined twins, a bearded lady, or a scary clown, you’d be well within your rights to demand your money back, no matter how fervently the carnival barker insists that this isn’t a freak show, sir, it’s a Chipotle. Anyway, Paulson tweeted the below image of her character(s), Bette and Dot. One is a bit melancholy, the other a bit melancholy yet determined; one adores the minuet, the other loves to rock ‘n’ roll. A hot dog makes them lose control, because it’s difficult to eat a hot dog when you have two mouths tussling over either end—next season, on American Horror Story.